Studying for the College Board’s Advanced Placement Tests can be hectic. With millions of tests administered each year, students find themselves in a position of finding great study materials, but with an unlimited number of resources to choose from. The following are a collection of websites with quality resources that will hopefully, cut through the confusion. This website lists out all of the different AP courses. On each course page, students can learn the breakdown of the exam and also see reviewed and recommended exam study materials. Overall, the site seems rudimentary, but provides a pretty good offering of information and study stuff. Here you’ll find a plethora of tools involving productivity, college planning, collaboration, research/writing, reference materials, organizers, courseware materials, and AP test prep resources. And with 100 tools there’s a great selection to choose from. Think of it as a comprehensive list. Of course, you won’t need all of the links, but there’s bound to be something useful! Shmoop provides a great selection of practice testsand topic reviews for every single AP Exam. Although some materials are not free, rest assured in their quality. They’ve received numerous rewards from multiple distinguished sources. Some include EdTech Digest, Webby Awards, Davey Awards, W3 Awards and more. From personally using this site, I’d say that it really worked for me. While some sites only gave general reviews, Shmoop got into the nitty gritty of things. Maybe the best source of information comes from the test makers themselves. 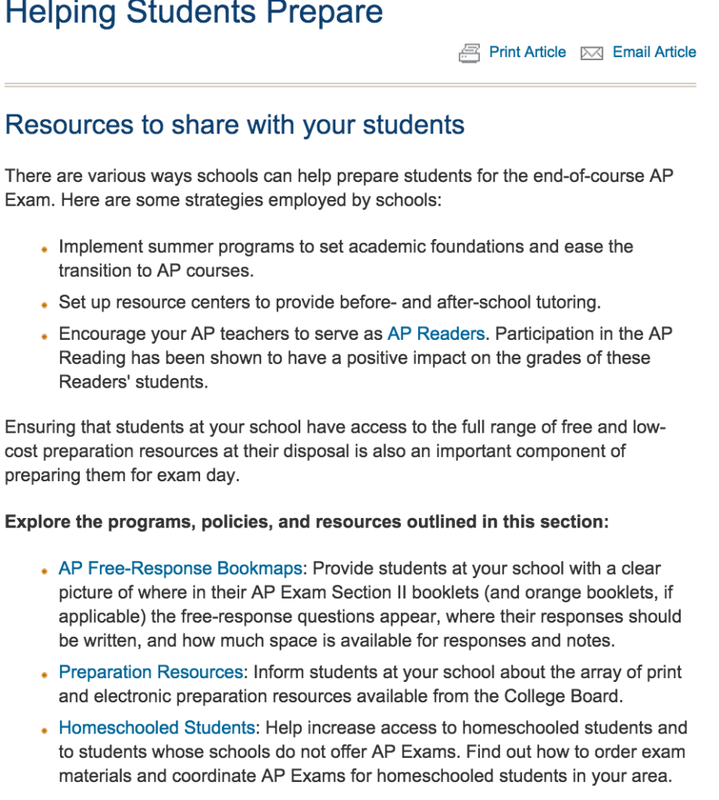 College Board provides a short list of recommended study resources along with practice materials and even a comprehensive study plan. One notable study source might involve being an AP Test Reader for a student with a disability. The site states that doing so seems to have a positive impact on test takers. Check them out. And for everything else, there’s Collegeconfidential.com. This website hosts a huge forum community of high school students, parents, teachers and college students. Here you can look for answers regarding anything college related that comes to mind and be answered by an experienced peer. Hopefully, this short list provides a stable starting point for your AP study process. Good luck on your exams! The Story of Apple, Microsoft…and Xerox? Angling for Admission: How Early Should Students Specialize?